Lenovo IdeaPad A2109 tablet is attractively designed with 9-inch 1280x800 LED display and 8GB storage. This tablet fully supports playing MPEG4 and H.264 videos. Lenovo IdeaPad S2110 tablet features a bright 10.1" 1280x800 display and offers up to 10 hours battery life and up to 32GB storage to play full HD video. However, like other best new tablets, Lenovo tablets do not have any DVD drive to directly play the new DVD movies. Have you ever thought that you could play the DVD movie on your Lenovo tablets even though there is no DVD drive in them? Instead of buying an external DVD drive, why not try a simple solution? Rip DVD to Lenovo IdeaPad tablet using professional DVD converter software and play DVD on IdeaPad tablet on the go. Free download the highq quality DVD ripper for Mac and PC to copy homemade & copy protected DVDs to Lenovo Ideapad Tablets in a fast speed. How Does the Software Work to Rip DVD to Lenovo IdeaPad Tablet? The best DVD to Lenovo tablet converter will work seamlessly to convert DVD to IdeaPad tablet accepted video format like MP4 or H.264 with high quality and cost the shortest possible DVD processing time. 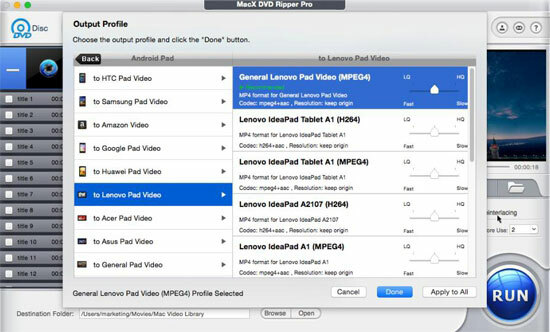 From the professional reviews and honest feedback from the numerous users, MacX DVD Ripper Pro can be deemed as one of the best DVD to Lenovo tablet converter choices. Buit with cutting-edge core technologies, this popular software enables users to rip and convert DVD to IdeaPad tablet on Mac or PC and play DVD on IdeaPad tablet without the need of DVD drive . More importantly, this popular software offers a robust performance to rip the protected DVDs which are locked by Disney X-project protection ,CSS, Sony ArccOS and region code and to transfer the movies to Lenovo tablets for handy playback. If you are Mac user, Download MacX DVD Ripper Pro for Mac, run the program and follow the following 4 steps to rip DVD to Android tablet Mac. For PC users, the equally powerful Download MacX DVD Ripper Pro for Windows (Windows 10 compatible) is available. Click "DVD Disc" button to import top 2015 movies or movies you want to rip. Alternatively, you may import a DVD folder by clicking "Path" button if you like. To rip copy protected DVD to Lenovo IdeaPad tablet on Mac , choose "Device Profile", then "Android Device", and select the specific Lenovo tablet device which you need to play the movie on later. Click "Browse" button to choose the path where you want to save the output video file, so you only need to transfer the video to your tablet. Click the "RUN" button to start the DVD to Lenovo tablet conversion. The Mac DVD ripper will finish the DVD ripping process steadily and fast. After that, you can import the movie to the device and play DVD on IdeaPad tablet. 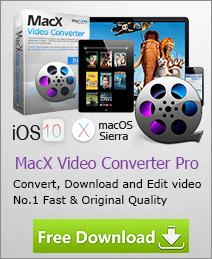 Other features: MacX DVD Ripper Pro is good assistant if you want to copy encrypted DVDs and regular DVD movies to MP4, AVI, FLV, MOV or MPEG video files. Meanwhile, this program works well to other devices, for example, import DVD to Apple iPad mini, iPad Air 3, iPad Pro, Mircosoft Surface Pro 4, Acer Iconia tablet, iPhone 6s/Plus, Sony, HTC etc. This article introduces a review of the best DVD ripper for Android and tells you how to rip and convert DVD to Galaxy S4, Galaxy Note 8, HTC One, Kindle Fire, Google Nexus, etc easily. Wanna rip DVD movies to iPad Mini compatible format on your Mac? This tutorial shares a hassle-free DVD to iPad Mini ripper for Mac users and tells you how to enjoy DVD movies on your new iPad Mini with a couple clicks. Seeking for a Mac DVD to Surface converter to enjoy DVD movies on Microsoft Surface tablet? This guide shares you the best DVD ripper for Surface tablet to suit your need. Just a few clicks, you can easily watch DVD movies on Surface tablet on the move. Notice: We only advocate using this best DVD ripper to rip commercial DVDs to Lenovo IdeaPad under the concept of Fair Use and do not encourage any illegal reproduction or distribution of copyrighted content. Please abide by the local DVD copyright law before doing it.